As I stated here, LXDC is a software by Eiichiroh Itoh to make your palmtop PC HP200LX a replacement for the "memory card holder" which can transfer data from DC-20/ES-1000 and store it on flash cards. The public distribution of this software is recently started on this page (written in Japanese). Connect LX to DC/ES, set LXDC to camera mode, and transfer data from DC/ES to LX. Turn LXDC to local mode to save images to separate files if needed. Connect LX to PC/Mac, run driver software for DC/ES on it, set LXDC to server mode to transfer images from LX to PC/Mac. Convert images to CMT files on LX, and transfer them to PC/Mac with your favorite methods (e.g. using flash cards). Run driver software for ES-1000 on Windows/Mac, and read CMT files to convert them to more common image formats. If your PC or Mac has a PC card slot, the latter method takes less time. DC-20 users can't utilize this method using DC-20 software as it has no capability to read CMT files. 50cm direct connection cable This makes the most convenient cable as you can make it as short as you want. If you make it only several decimeters long, you can transfer images in a cafe without being severely suspected :-). CD, DR, RS, and CS are shorted in F1015A, but LXDC seems to run without this short circuit. 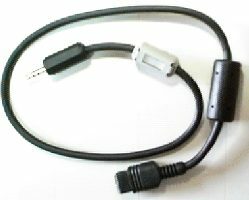 This cable can be connected to HP F1015A (whose one end is DSUB 9pin female and the other end is connected to LX). Parts for making it are easy to find and inexpensive. This method is explained in detail in the DC-20 Analysis Diary by Itoh-san (in Japanese). A picture of the cable is available here. In this method, all you have to do is to connect ready-made parts; no craft required. If you have a connectivity pack, you should try this first. The point is to relay the cable that comes with ES/DC to F1015A; to do this, you need a cross-connection adapter (or null-modem adapter) whose both ends are DSUB 9pin male. The problem of this method is that it makes a very long cable as two cables are connected without being cut. DSUB 9pin cross adapter is included in the connectivity pack (HP F1021A) or the connector/adapter kit (HP F1023A) for LX. Standard gender changers with the label "U.S. PAT: 5190481" can't be used for this purpose as they are of straight-connection. Please send questions and comments about this page to hideki@teikan.net.